There’s but one thing in all the world that links every last one of us. Even people as different as you, me, and the unemployed guy who used to be Vice President in Charge of Morale at NBC. All of us hate rejection! And that applies every bit as much to the inestimable Rejecter as it does to the lowly Rejectee. Frankly I don’t know how professional Human Resources recruiters handle the rejection --- that is, the dishing out of it. A regular part of their regular grind is telling job-longing folk a longed-for job will not become a regular part of their regular grind. Think how bad you’re feeling right now for rejecting me just for that ridiculous and annoying last sentence! As a a former HR professional who has handled recruitment matters, I have always anguished over how to tell unsuspecting applicants the vote on their employable worth has been multiple thumbs down. As someone who is not exactly a bastion of personal security myself, I’ll put myself through sheer living hell to avoid putting anyone else through modestly living heck! Of course I did! I haven’t pulled the old “no call back” trick since I broke up with my barber in 1982 after he neatly trimmed off half my ear, but at least then evened the other with it. But every job seeker on the planet knows that this letter, as translated from the original Sanskrit, means “take a hike, loser --- if possible, on an unmarked boulder-strewn trail abutting a deep and gaping natural chasm!" "We're keeping your resume on file for future opportunities." the letter often reassuringly continues. Actually "we're keeping your resume on file for laughs" is how the original Sanskrit actually translates. So, I made the personal phone call. Nervously, tentatively, I made the call. “Oh, Hi, Mr. Block!” It was unmistakable – that sound of positive anticipation in his voice. Eliciting that sound of very negative anticipation in mine. No, I didn’t exactly get the message across to George. I’ll have to do that tonight at dinner just after the movie. Probably Avatar. Hi Perry, took me a while to get here even after following you on twitter, blame it on snowpocalypse and me getting stuck in Philadelphia during the big 'ol storm of '10. Love, love, love the blog. And after reading this post I am now slightly better prepared for what I am supposed to receive back from my editor this afternoon when she returns my manuscript of my memoir to me. If I haven't slit my wrists I look forward to your next post. Thank you for the nice words. As I mentioned before when you were in Philadelphia, it is better to be beginning a writing career at 50 than 59. Wait, did I say 59? How silly of me, I meant 39! I was actually trying to say how much luckier I am than you starting at such a tender age! Imagine how good I'll be at 50! I went over to your blog to attempt to sign up and found myself enrolled in something called "She Writes." Turned out I was the only guy there! Felt a little like being Tony Curtis or Jack Lemmon in "Some Like it Hot." Wound up carefully reviewing the work of many of the writers on the blog; any chance you could introduce me to the author of "High School Hi-Jinks?" If things don't go well, please don't slit your wrists. I'm in another one of those phases where I just can't buy a follower. If it's all that bad, I'll pay for a couple of therapy sessions for you. I don't want to ever drop under 1000 followers again. Thanks for writing and let's talk "old person" stuff again soon! While I was very impressed with your qualifications, I am seeking someone whose specific experience as a humor writer more closely comports with the requirements of humor pieces for this blog. I am keeping your resume on file for future opportunities. But don't hold your breath, loser! 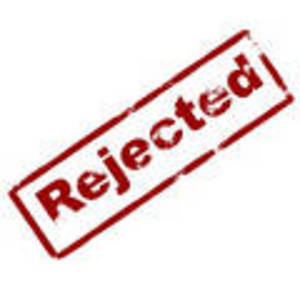 Thank you very much for your recent humor piece submission "Rejection's Like That." While we were very impressed with your humor writing qualifications, we are seeking someone whose specific experience more closely comports with the requirements of this blog. We are keeping your humor piece on file for future opportunities. P.S. Not really. We are keeping your humor piece on file for laughs --- and not the kind that's good for you!